Active Ingredient (in Each Tablet) - Purpose. 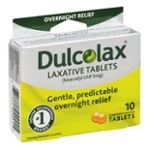 Bisacodyl Usp 5mg - Stimulant Laxative. Inactive Ingredients: Acacia Gum, Beeswax, Carnauba Wax, Corn Starch, D&c Yellow #10 Aluminum Lake, D&c Red #30 Aluminum Lake, Glycerin, Glyceryl Monostearate, Iron Oxides, Lactose Monohydrate, Magnesium Stearate, Methacrylic Acid/ethyl Acrylate Copolymer, Methyl Paraben, Polyethylene Glycol 6000, Polysorbate 80, Povidone, Propyl Paraben, Starch, Sodium Benzoate, Sucrose, Talc, Titanium Dioxide, Triethyl Citrate. Do Not Use If Individual Seals Are Broken. Do Not Use If You Cannot Swallow Without Chewing. Ask A Doctor Before Use If You Have: Stomach Pain, Nausea Or Vomiting. A Sudden Change In Bowel Habits That Lasts More Than 2 Weeks. When Using This Product: It May Cause Stomach Discomfort, Faintness And Cramps. Do Not Chew Or Crush Tablet(s). Do Not Use Within 1 Hour After Taking An Antacid Or Milk. Stop Use And Ask A Doctor If: You Have Rectal Bleeding Or No Bowel Movement After Using This Product. These Could Be Signs Of A Serious Condition. You Need To Use A Laxative For More Than 1 Week. If Pregnant Or Breast-feeding, Ask A Health Professional Before Use. Keep Out Of Reach Of Children. In Case Of Overdose, Get Medical Help Or Contact A Poison Control Center Right Away.